At the TEDGlobal 2012 conference, social psychologist Amy Cuddy gave the talk “Your body language shapes who you are,” in which she detailed the effects of “power posing,” based on research by herself and other scientists working in the field. Cuddy delivered a beautiful talk that resonated with our audience and the idea went viral, going on to become one of TED’s most watched talks ever, with more than 39 million views as of February 2017. The original scientific paper and her talk inspired numerous studies and more research on the effects of posture, all part of the process of science at work. As Cuddy herself explains, this is the normal, expected progress of science — and one reason the job of a scientist is never done. Yet during this process, a debate arose in the social science community about the robustness of some of the findings on power posing. For instance, some results that Cuddy quoted in her talk have not always replicated in later studies, and in the context of broader concerns about a replication crisis in social psychology and other scientific areas, there has been aggressive criticism of her work by some. In numerous interactions over the past few years, we’ve been impressed by Cuddy’s commitment to science and by her passion for her work. In light of the recent debate, Cuddy participated in a series of Q&As with TED science curator David Biello about her original study, the effects of power posing and how her views and thinking on this fascinating topic continue to develop. TED: What is the current state of the evidence regarding power posing? TED: So what is the power posing effect? AC: I now refer to this general phenomenon as the “postural feedback effect,” but if I am choosing just one effect – one outcome — the key finding is simple: adopting expansive postures causes people to feel more powerful. In the years since my coauthors and I published our 2010 paper, this effect has been replicated in at least nine published studies and in at least four unpublished studies from nine different labs. What’s absolutely clear from the studies is that adopting expansive poses increases people’s feelings of power and confidence. And feeling powerful is a critical psychological variable. As Columbia University professor Adam Galinsky and colleagues wrote in a 2016 review, a person’s “sense of power … produces a range of cognitive, behavioral, and physiological consequences,” including improved executive functioning, optimism, creativity, authenticity, the ability to self-regulate and performance in various domains, to name a handful. In this vein, the second postural feedback effect is more like a constellation of effects, supported by dozens of studies, and it is this: adopting expansive postures seems to activate the behavioral approach system. A bit of background: Two systems are believed to drive most human feelings, thoughts, behaviors and even physiology — approach and avoidance (i.e., inhibition). When our approach system is activated, we are happier, more optimistic, more confident, more creative, more likely to take action, more likely to seek rewards and opportunities, more physically energetic and less inhibited, among other things. Activation of the inhibition systems leads to the opposite effects. According to the well-established approach/inhibition theory of power, power activates the approach system, whereas powerlessness activates the inhibition system. When we look at the complete collection of published experiments on adopting expansive versus contractive postures — there are 57 studies from more than 100 researchers — we can see a pattern of feelings, thoughts and behaviors that represent the behavioral approach system, such as performance in stressful situations, motivation, flexibility/rigidity of beliefs, ability to remember positive/negative words, ability to be focused and present, interest in learning new things, physical strength, assertiveness, mood and leadership behavior, among other related outcomes. But it will be critical to examine each of these individual effects in greater detail, through replication attempts, and in different contexts. Surely, results will be nuanced and mixed, with some effects proving to be more robust than others. TED: What effect does holding an expansive posture have on hormones? AC: The short answer is, the current body of evidence regarding hormones effects is mixed, so I am currently agnostic about how posture affects hormones. But the long answer, which involves looking closely at the studies, findings and methodological issues, may shed a bit more light on the complicated answer to the question. TED: How has the science about posture and hormones changed since your talk? AC: It’s evolved in three primary ways. (2) It’s become clear there is great variability across studies and labs in how researchers measure hormones, and we now have a better understanding of best practices (although no consensus yet). The area of study looking at how social stimuli affect hormones is in its infancy. Methods are improving every month, new findings are failing to replicate or contradicting old findings, and researchers are working hard to better understand the mechanisms and boundary conditions of the effects that they predicted and observed in previous studies. However, researchers have not reached consensus about the best practices for measuring and analyzing hormones in experimental research, which means that we see substantial variation across labs in what medium is used (e.g., saliva vs. blood), how that medium is captured (e.g., at what time of day are hormones captured, which is critical for cortisol measurement, how soon after arriving at the lab, and how soon after the key experimental manipulation — the latter two critically affect results). The issue of analysis is equally fraught. For example, one very recent paper compares results of enzyme immunoassays from three of the most commonly used hormones labs in the US (including the lab we used for our 2010 analyses), finding inconsistencies across labs and significant differences between the traditional assay methods that most all of us have been using and the new method of liquid chromatography tandem mass spectrometry, which seems to be more accurate — all of which impact results and reproducibility. (3) Several related studies on the effects of posture on hormones have yielded null or mixed results. In the closest conceptual replication, conducted at the University of Zurich by Eva Ranehill and colleagues, adopting expansive versus contractive postures made people feel more powerful, but it did not affect hormones or risk-taking behavior. This study had a very important strength: a larger sample (200 participants). However, many methodological differences between the Ranehill study and our 2010 study may seem trivial, but they make it trickier to interpret the different results. For example, while Ranehill et al. had participants hold two poses for a total of six minutes, we had participants hold two poses for a total of two minutes. Should this moderate the effect on hormones? Although it is unlikely, perhaps all of the a priori hypothesized effects were all false positives, statistical flukes. Or perhaps it could be the result of any of at least a dozen other reasons, such as differences in study protocol, population, measurement and so on. But that’s the beauty of science. As methods are refined, as more studies are done, we will know more about the conditions under which you do and don’t see these hormone changes, which is fascinating. And after more studies have been conducted, if the hormones findings turn out to be incredibly fragile, then so be it. TED: Have any researchers been able to replicate the hormone part of your 2010 study? AC: Unfortunately, we have no direct replication of the 2010 study of the effects on hormones, only conceptual replications that differ from the original study in numerous ways. But it’s interesting to consider a 2004 study of postural feedback that used blood serum measures of testosterone and cortisol, which are less noisy than salivary measures. In the study, all participants adopted an extremely expansive yoga pose, called the cobra, for around two to three minutes. There was no control or contractive posture condition — a shortcoming of the study — but the researchers were able to compare the participants’ time 1 hormones measures (taken before the pose) to their time 2 measures (taken after the pose). All eight participants showed an increase in blood serum levels of testosterone and a decrease in blood serum levels of cortisol. In this study from a different field, where different methods were seen as appropriate or standard, we see the same pattern as demonstrated in our 2010 paper. Moreover, in an unpublished study with 180 participants (approximately 90 per condition) and using salivary measures, another researcher found 3 of the 4 hypothesized effects: expansive postures increased testosterone and decreased cortisol, while contractive postures increased cortisol but had no effect on testosterone. But I also recently heard about another replication attempt, done in the Netherlands, in which the hormonal effects did not replicate. I believe that study will soon be published and available. TED: Looking back at your TED Talk, do you wish you’d done anything differently? AC: My 2012 TED Talk was based on the scientific methods and evidence that were available in 2012. Scientists must be at liberty to revise, elaborate and update their assessments as new evidence is generated, as methods improve, and as we integrate findings across labs and disciplines. If they are not able to do that, science becomes a historical artifact. The field of social psychology has undergone a sort of methods revolution since my talk, which has led to some methodological improvements that will undoubtedly strengthen the science. For example, if I were conducting and presenting the research now, I would have a larger sample size, and I would have conducted replications of all effects (we conducted replications of the feelings of power and risk-taking results, but not of the hormones effects). I also wish I had brought in other theory and evidence to shed light on the physiological mechanisms, such as the relaxation response. I might have paid closer attention to how the specific poses — hands on hips, victory pose, feet on desk — might differentially affect breathing, muscle engagement and other variables that could be involved in the physiological feedback mechanisms. As should be clear from where my work and writing have gone since then, I’m more interested in the effects of our own nonverbal behavior on our ability to be present, to be effective communicators and connectors, to approach stressful situations with less anxiety and more confidence and to leave these situations with less regret and more satisfaction. Perhaps I could have emphasized that aspect a bit more. Finally, as sticky as the power-posing-for-two-minutes idea is and as much as many people feel it has helped them, it oversimplifies the broader idea — that how we carry our bodies affects how we feel about ourselves, how we interact with others, how we perform and so on. My unintentional oversimplification may have allowed people to miss the forest for the trees. That makes me sad because it’s a much bigger idea. As Maya Angelou wrote, “Stand up straight, and realize who you are, that you tower over your circumstances.” It’s not just about standing like a superhero for two minutes; it’s about carrying yourself with power and pride and poise, as you deserve to do. TED: You have been the recipient of some very harsh and, to my eye, sometimes unfair criticism. Do you think scientific discussions about conflicting findings have changed since you started in the field? AC: Science requires criticism of ideas — it is essential. Without it, science would not survive, and when you choose to become a scientist, you are accepting that your work will be criticized. Papers get rejected, findings are scrutinized, methods are challenged and ideas are disputed. Theoretical refinement, knowledge and new ideas spring from this kind of criticism. But there’s a difference between attacking scientific ideas and attacking scientists. The now frequent, intense, ad hominem attacks and public shamings by scientists against scientists, which I’ve experienced and which mostly occur online in blogs or via forms of social media, seem to represent a new phenomenon. Not only do these kinds of tactics unnecessarily injure individuals and impede science, they also model poor behavior. How on earth are we going to convince our children to avoid these behaviors if we ourselves can’t resist them? Fostering a culture in which people agree they can safely discuss, debate, revise and self-correct — without fear of censure, derision or expulsion — is essential. In management science, this is called “psychological safety,” and, as numerous studies have shown, it is one of the hallmarks of healthy and effective organizations. It increases innovation, employee engagement and the extent to which people learn from their mistakes. TED: What effect does this ad hominem criticism have on science and scientists? This affects not only scientists, it affects the accumulation of evidence and the progress of science — and that affects everyone. I’ve heard from three different labs that have conducted research on “power posing” but who said they feel they cannot submit the work to journals, because they fear backlash after seeing what has happened to me. That is the sound of science’s brakes squealing. Rather than spur creativity and encourage contribution, ad hominem shaming, derision and witch hunts shut it down. “In disputes upon moral or scientific points, let your aim be to come at truth, not to conquer your opponent. So you never shall be at a loss in losing the argument, and gaining a new discovery.” Arthur Martine wrote that sage advice in his 1866 guide to the art of conversations. And the very wise Daniel Dennett offers a current set of guidelines on “the best antidote [for the] tendency to caricature one’s opponent” in his book Intuition Pumps and Other Tools for Thinking. Let’s have conversations, not controversies. TED: What is the best way for TED to present social science like this, in your view? How can we present solid scientific results while also making the science attractive and understandable to a general audience? AC: Many fields of science, not just experimental psychology and not even just social science more broadly, are experiencing methodological growth periods that will ultimately lead to more rigorous experiments that yield more robust and reproducible findings. That’s a very good thing for all of us, because it allows us to have more confidence in the existence and boundary conditions of any phenomenon. But that doesn’t mean we need to scrap all of the science that was conducted before the most current methods revolution. Undoubtedly, my field, and all the others, will have more methods revolutions, and we will integrate what we discovered using the old ways with what we discover using the new ways. For example, if we’d applied some of today’s tools for “determining” whether an effect is real or not, we’d have dismissed the effect of the Salk vaccine on paralytic polio (r = .01) and the effect of aspirin on lowered risk of heart attacks (r = .03). Harvard psychologist Dan Gilbert said in a recent methods symposium at the Harvard Kennedy School of Government, “Science doesn’t have a truth test; it has robustness tests.” There will always be uncertainty. Science is never finished. No question is ever absolutely answered. If that’s what we’re waiting for, then we won’t be hearing many more science talks. Just as any paper is a representation of what is known at that time, any TED talk will be the same. So we must allow scientists to revise, refine and update, and we must find effective ways for scientists to share those revisions, refinements and updates with the public. I would like to see TED Science Updates. Several years after delivering a talk, scientists would return to discuss the inevitable changes and refinements to what they presented several years earlier. Perhaps these very short science update talks would be tethered to the original talk, so that the update automatically plays when the original talk ends. Not only does this give scientists the opportunity to update and audiences access to the most current science, it could also play a role in demonstrating to people just how dynamic science is! Far too many of us were led to believe that science is a fixed set of facts. In some ways, nothing could be further from the truth. Science is a living, ongoing progression of improving methods, producing new evidence and accumulating and integrating the old knowledge with the new knowledge. 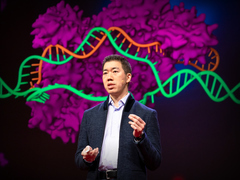 By giving TED audiences a closer look at how science evolves, I believe we will be improving science literacy, which is desperately needed in an era in which we’re bombarded with hastily written, clickbait-headlined stories about science breakthroughs. A couple of things that get lost in this discussion are some surprising things I’ve learned from the feedback I’ve gotten from strangers. First, we don’t give the public — non-scientists — enough credit. We don’t respect they might be able to take in information, integrate it with what they know and with what they will learn in the future and dig deeper if they want to learn more. Second, inviting people in to learn a bit about a field of science or an area of scientific research is a wonderful way to encourage a more diverse group of people to enter STEM fields. I hear from so many young people who say, “I didn’t know about social psychology. How do I learn more about it?” For example, my former lab manager, who’s now working on his PhD, got into social psychology as a result of watching Dan Gilbert’s 2004 talk (TED Talk: The surprising science of happiness). He said he probably never would have known about it if he hadn’t seen that talk. TED: What are you working on now? AC: My focus now is on finding ways to empower marginalized individuals and groups. I’m spending this academic year at the Harvard T. H. Chan School of Public Health, which gives me great opportunities to work with researchers whose main focus is to develop evidence-based interventions that improve people’s health and general wellbeing, and this is exactly what I want to be doing. Essentially, my current research is about building ladders up and taking walls down. In the “ladders up” category, I’m particularly excited about my work on gender, nonverbal behavior and power. We know that men are more likely than women to adopt expansive postures, and we know that using confident body language is one of the best ways for women to avoid being negatively stereotyped in the workplace. However, my recent developmental research with young children identifies the age at which kids start associating expansive posture with males and contractive posture with females — and it’s quite young. By age 4, children strongly associate expansiveness with male. They believe that wooden dolls in expansive postures are boys and that wooden dolls in contractive postures are girls. By age 6, that association is even stronger. So how do we get our daughters to expand? Identifying evidence-based strategies is one of my primary goals now. I’m also studying the relationship between power and dimensions of walking. As it turns out, power is associated with occupying more space when walking — more arm swinging, more vertical range, more head movement, longer strides and so on. If changing our posture changes how we feel, can changing simple movement, like how we walk, do the same? “Walls down” research is geared toward developing the most effective, evidence-based, prejudice-reduction interventions and making them broadly available for use in schools and organizations. In fact, for more than 15 years, the majority of my research has focused on the psychology of stereotyping, prejudice and discrimination. Now I want to move from documenting the problem to identifying solutions. And this is something that may be more critical now than ever.